WHY such a loyal following for this "sunsational" penthouse? Answer: It's simply Polo's best in every way; and discriminating guests prefer staying in one of the resort's few available top rated "prime luxury oceanfront" condos that features an upscale remodel filled with quality furnishings. The penthouse sits in an unequaled location that provides far reaching ocean views and privacy...and its just a few easy steps to one of Maui's top ten sandy beaches, which is the "icing on the cake". Adults especially appreciate that the Polo Beach Club & the penthouse are adult friendly and NOT suitable for children or groups. Games, lawn activities, events, and groups are not allowed on the grounds or in the pool so Polo's atmosphere remains less noisy than many places. Smoking is NOT allowed at or on Polo Beach. The condo's interiors reflect Hawaii. The quality design includes beautifully remodeled tropical interiors with distinct architectural features, luxury amenities, taller windows and a private lanai boasting huge ocean views. This exceptional condo has great reviews along with additional details from guests in the guest book that's found following VRBO's "about owner" read more section. The condo's superior corner location at Polo Beach & its tropical furnishings make it a favorite. The condo is not in a rental pool so its fresh & lovely plus provides guests with competitive "prime luxury oceanfront" owner direct rates. The penthouse's multi directional views include vast ocean horizon vistas, Turtle Bay, and three other islands! Its ocean views are so outstanding they were featured front page on resort brochures! Unlike most units, even its second bedroom has a great view overlooking majestic Mt. Haleakala. All this visual wonder while the condo's perfect corner location provides protection from strong daily trade winds & less noise from the park and hotel side of the resort property. Location makes the difference: Sitting in the resort's best spot for privacy, views, easy access, & sunshine, the penthouse overlooks the beach below, the fresh water pool, Jacuzzi spa, landscaped gardens, ocean, and SW Maui. The barbecue & fresh herb garden are on 803’s side. Spectacular sunsets are the norm....This is not a lower floor or back unit nor on the darker or windy property side...the condo occupies the top floor's premiere corner location with expansive views & less foot traffic so no one walking by your doors or windows. (Also fewer insects on the top floor). The condo's private quiet location is considered unrivaled as Polo's best spot. Yes, you can wave to numerous whales in season, or dolphins and turtles year around. They frequently frolic in the Polo waters in front of 803's living room and lanai. Swim, snorkel or simply wade in Hawaii's blue waters. The ease of direct beach access from the condo means convenient strolls at the water's edge or a quick dip before breakfast or dinner. Star gaze and fall asleep to the sound of waves, awaken to glorious morning skies and ocean waters, which are also visible from the romantic master suites' king bed. (We are pleased that many of our happy honeymooners return for anniversary trips). * Quality comfort & designer furnishings keeps the penthouse a favorite among Polo Beach Club devotees who enjoy nicer things: Brown Jordan lanai furniture, Sub Zero, Bosch, Tommy Bahama's furniture, hand etched glass panels and more. The condo's tropical decor has native Koa woods, imported faux stone tile floors, & marble accents. Extra features such as island art, higher ceilings, taller windows, electric blinds, new luxury back supporter mattresses provide tropical comfort & carefree relaxation. Music & book library, too. The top floor's exclusive filigreed overhangs increase enjoyment of the lanai during the afternoon's brightest sunlight moments without blocking the views or restricting lanai use. Its premiere location provides important protection from strong trade winds, which means greater full-time enjoyment of the lanai. *There's more: the easy care gourmet lover's kitchen has outstanding ocean views as well as viewing miles of uninterrupted island landscape from its windows. Good views from all vantage points! The fully equipped kitchen’s comes with 3 sets of china & stemware plus some staples to get you started. (This translates to relaxed round the clock oceanfront dining options where soft morning skies and brilliant evening sunsets are the norm--or take advantage of delivered or catered meals--or stroll next door to one of the nearby neighboring award winning restaurants). An added option is your refrigerator stocked on arrival. * Three Large screen HDTV systems, sound system, cable, wi-fi high speed connections, even i-pod docks & the granite topped computer station keep you easily connected. * Penthouse 803 stands as a rare oceanfront gem. Its one of the few Wailea condo's listed in BEST PLACES Hawaii...quite an honor!. By the way, our sandy beach is listed as one of Maui's top ten beaches and our small area is renown for the island's finest dry sunny weather! * Complimentary covered garage parking included. If this sounds like the type of well maintained & cherished adult only condo with Hawaiian atmosphere that you've been searching for, please feel welcome to request to book. The penthouse is the perfect place to experience life on the island's gold coast while greatly enjoying the blended perfection of luxury and relaxation...a "sunsational" condo. The penthouse's Hawaii approved Tax# is W 001-626-3168-011. Note: At times 803's photos & our video show different colored cushions, bedspreads, even furniture, because we frequently change or update items. Changes are often noted with text on the photo banner that you see when you enlarge the photo. We are pleased that optional car rental discounts from several island companies are also available to guests who stay in this condo as well as trip insurance. We are Maui-fans! 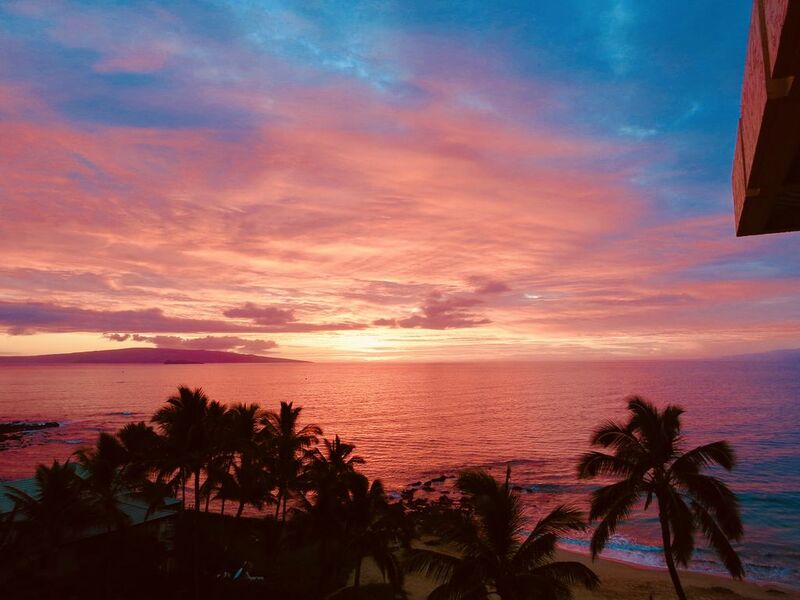 Selected as the world's number one best island & we agree.We prefer Maui for it's diversity and eagerly looks forward to the many activities and warmth that it offers from our cold winters...and surprise, we also found Maui's moderate soothing temperatures exist year round. It's an amazing island with an abundant choice of great dining experiences, shopping choices, and many unique activities. We are professional business people who like Maui's healthy lifestyle and its wide range of activities. We discover something new every time we visit.The native beauty, fresh air, azure waters, friendly people, and sunshine impart rejuvenation and aloha into our busy lives. Mt. Haleakala continually captures our interest, whether for star gazing, spectacular sunrise views, or hiking into the crater. The ocean outside our door teems with colorful sea life. This is our favorite get-away! Pacific Rim dining options are numerous. We enjoy sharing this wonderful condo with others, who like us, want to be surrounded by Hawaii's refreshing charm, clear blue water, fine food, many activities, and swaying palms in an unforgettable setting. Both bathrooms feature upscale Toto, Kohler, Grohe products, stone and marble accents for luxurious relaxation and privacy. 803 overlooks one of Maui's top ten beaches ...golden sand and swaying palms. Wailea Makena's closest beachfront property and the penthouse sits just steps away from its soft sand crescent shaped Polo Beach. Your choice of all Wailea Golf Courses in our 'backyard'. Beautiful greens in view from side lanai. 803's expansive multi-directional ocean views have been featured in resort brochures. Spectacular ocean views of Hawaii's blue waters, three other islands, turtle bay, and colorful sunsets . 803's "Prime luxury oceanfront" location is just a few easy steps to its soft sand beach! Miles of oceanfront views from the penthouse's SW corner location. All towels, including beach towels, provided. French press, regular cofee maker with time controls & automatic turn off. Spices, sugar, flour, vinegars, herb garden , tea, and more...a bit potluck but many useful and handy starter items. Three sets of china, stemware &more! Lovingly &fully furnished beyond regular rentals. This well equipped condo home features gourmet items to enjoy but more than you'll probably need. The Polo Beach Club sits on two beachfront acres with beautiful soft green, lawn, palm trees, and beautiful tropical plants. Chaise lounges provide places for ocean, sunset views, & quiet rest. Nearby tennis only moments from penthouse at famed & fun Wailea Tennis Courts. The Polo Beach Club & the penthouse are adult friendly and not suitable for children. Games, activities, events, and groups are NOT allowed on the grounds or in the pool so less noise than many places. No smoking allowed at or on Polo Beach. Great South facing view towards Makena. Well kept and clean. I'm not sure it gets any better than this, an elegant penthouse condo right on the beach in Wailea. The condo is clean, comfortable, well equipped, and has a fantastic view. The owner is fantastic, communicates well and is very helpful. My wife and I stayed here for a milestone birthday and enjoyed every minute....with perhaps a little anxiety over Hurricane Lane but no predicting the weather! Thank you for being such outstanding guests!! You certainly rose to the occasion and surpassed it in view of the bad weather news that forecast Hurricane Lane to hit Maui with an ugly impact. In the past, our area has rarely seen a hurricane hit because they usually turn away and weaken before reaching Maui. While we all hoped for this to be the case with hurricane Lane, no one knew for sure and you two were unruffled and very cool. I thoroughly enjoyed your upbeat messages, especially the "cheers" you signed off with...and you sent those before knowing the storm would turn away or fizzle out without much rain or wind in Wailea Makena. Polo Beach 803 is a beautiful and extremely comfortable condo and it's in a prime location. Being in Wailea you are close to resorts, shops and a variety of beaches including the one that Polo Beach sits on. But what we loved most was after visiting these other locations (most in walking distance) that are busy and some times loud - we could retreat to a quiet haven and enjoy the ocean views without distractions. The two bedrooms are comfortable with plenty of closet and drawer space. The kitchen is extremely well equipped with most anything you would need. There is a stackable washer and dryer that comes in handy if you have an extended stay. Everything is beautifully decorated and the owner is extremely helpful and efficient when we were making arrangements. There is a pool and herb garden on the property. Parking is included (garage under building). We had a wonderful vacation and would definitely return to this penthouse. Aloha! Thank you for being such outstanding guests and for taking time to share your experience! Our housekeeper was impressed with you and your loving care of our island condo. We love this condo and are pleased that you appreciated its wonderful uniqueness too. Yes, come again...thank you for being part of our condo's circle of friends. Our hostess with the mostest! Second time we’ve rented her condo and we enjoyed every minute! Thank you! Thank YOU!! What a nice comment. You are wonderful guests and its a pleasure to share our island condo with you....we love this condo, its premiere location, views and easy life style so like you, we too, enjoy every minute we are there. Come back when you can! Our Polo Beach winter vacation was awesome! Our vacation was great because of many reasons. This beautiful condo located beachfront on Polo Beach was a big part of our exciting and fun vacation. This condo is beautifully furnished, and extremely well kept and clean. The views from this unit are fantastic! We had our morning coffee on the Lanai, and every morning without fail, we would see passing whales break surface and provide a wonderful show. We also rented Kayaks and were able to store them for the week in the racks located in the parking garage. That was a huge bonus! The owner is wonderfully helpful and available when you need her help or advice. Thank you for helping our stay become one of, if not the best vacation we have had on Maui. Aloha...I'm glad to hear from you and that you had a such a awesome & relaxing stay in the penthouse. It's a gem! Thank you for taking time from your busy life to share your experience and good comments. You were delightful guests! I always enjoy hearing how much guests enjoy the condo...Not all condos sit so close to the ocean and beach or have taller windows like this penthouse, so it always exceeds the first time guest's expectations when they walk in, and are greeted by expansive ocean views with the whales swimming by right in front of them. I love the "wow" responses. The whales usually arrive November for the winter to birth their babies. We affectionately call new born whales " Polo babies"... Seeing one is a special thrill..I'm so happy for you! (The year around turtles and dolphins that swim by are amazing and fun to see, too). Sandy beach, Oceanfront Walk, Beach-combing, World class Dining, Spas, Massage Services, Whale watching, Art Gallerys, Golf Courses, Tennis Courts, Luaus, nearby nature walks, historic sites, Shops at Wailea Shopping Center, Wailea Gateway Mall and three of the world's top ten resorts as next door neighbors.